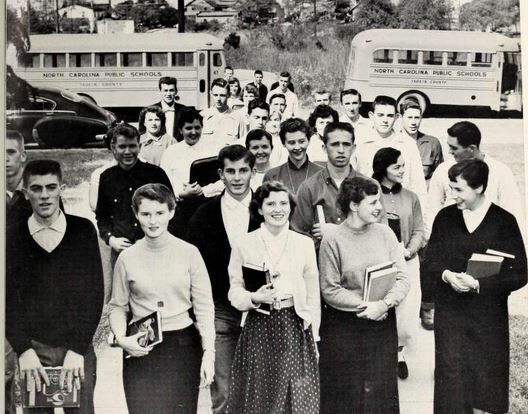 Students heading to a day of school at Jonesville High School, as featured in the 1956 East Bend Whispers yearbook. Yearbooks from several libraries in the Northwestern Regional Library System are now online. From Danbury Public Library, yearbooks from Sandy Ridge High School, Pinnacle High School, Francisco High School, Nancy Reynolds High School, Germanton High School, Walnut Cove High School, and London High School are available. From Alleghany County Public Library, yearbooks covering 1959-1961 at Sparta High School are online. From Elkin Public Library The Elk yearbook, from Elkin High School, is now online. From East Bend Public Library, the town’s scrapbook celebrating their centennial in 1987 is available. And from Yadkin County Public Library, over 50 yearbooks from East Bend High School, West Yadkin High School, Yadkinville High School, Jonesville High School, and Courtney High School are now online. To view more materials from across North Carolina, visit DigitalNC.